Our co-founder, Cody Lampl, grew up in small town Idaho with a passion for hockey. A self described gym and rink rat, Cody's passion and love for the game have been the driving force behind his hockey career. Cody moved from Idaho to play for the Dallas Stars midget AAA hockey program which finished third at nationals, earning himself a scholarship to Colorado College. At CC, Cody became a very versatile player for the Tigers playing both forward and defense, while helping the team reach the NCAA tournament twice. After graduating from CC, Cody played six seasons of professional hockey in North America, including trips to both the ECHL Kelly Cup Finals and the AHL Calder Cup Finals. Cody has extensive experience coaching and training hockey players. He has coached at eight Rocky Mountain District Camps, as well as being the owner and operator of his own off ice training facility in Sun Valley, Idaho, the Lampl Hockey Garage. Cody currently plays with the Adler Mannheim of the German DEL. You can contact Cody at cody@mountainhighhockey.com. Joey Carroll grew up playing his minor hockey in New Mexico before deciding to leave home to pursue junior hockey in Canada. Upon completion of his junior hockey career, Joey turned his focus to coaching, where he founded the largest skill development program in New Mexico. The Warrior Hockey Academy was founded in 2011 to provide the youth hockey players off New Mexico with high end skill development instruction through their camps, clinics and private lessons. Coach Carroll has extensive knowledge with age appropriate skill development working with individuals and students from the squirt to midget levels. 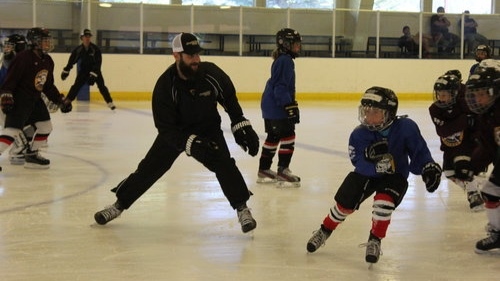 Joey is a level 4 certified coach through USA hockey.